This article is about the year 1446. Wikimedia Commons has media related to 1446 . Year 1446 ( MCDXLVI ) was a common year starting on Saturday (link will display the full calendar) of the Julian calendar. It is one of eight years (CE) to contain each Roman numeral once (1000(M)+(-100(C)+500(D))+(-10(X)+50(L))+5(V)+1(I) = 1446). September 27 – Battle of Otonetë: Skanderbeg defeats the Ottomans. Before October – Sultan Mehmed II of the Ottoman Empire is forced to abdicate, in favor of his father Murad II, by the Janissaries. October – Murad II invades Attica, forcing Constantine XI to return Thebes to the duchy of Athens, and remove the tribute imposed in 1444. Murad II imposes his own tribute. October 9 – The hangul alphabet is created in Korea, by King Sejong the Great of Joseon. The Hunmin Jeongeum , published during the year, is considered the start of this brand new scientific writing system. The Battle of Otonetë occurred on September 27, 1446, in upper Dibra in Albania. The Ottoman commander, Mustafa Pasha, was sent into Albania, but was soon intercepted and defeated by Skanderbeg. It was one of the many victories won by Skanderbeg. George Castriot, known as Skanderbeg, was an Albanian nobleman and military commander, who served the Ottoman Empire in 1423–43, the Republic of Venice in 1443–47, and lastly the Kingdom of Naples until his death. After leaving Ottoman service, he led a rebellion against the Ottoman Empire in what is today Albania and North Macedonia. Skanderbeg always signed himself in Latin: Dominus Albaniae, and claimed no other titles but that in documents. Nuno Tristão is killed by natives in the coast of Senegal. Portuguese navigator Álvaro Fernandes reaches the mouth of the Casamance River in Senegal. The Precious Belt Bridge in China is fully reconstructed. In Italy, the siege of Cremona, by the condottieri troops of Francesco Piccinino and Luigi dal Verme, is raised after the arrival of Scaramuccia da Forlì. The Blarney Stone is set into a tower of Blarney Castle in Blarney, County Cork in Ireland. 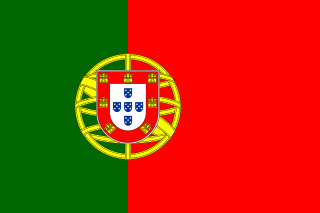 Nuno Tristão was a 15th-century Portuguese explorer and slave trader, active in the early 1440s, traditionally thought to be the first European to reach the region of Guinea. Senegal, officially the Republic of Senegal, is a country in West Africa. Senegal is bordered by Mauritania in the north, Mali to the east, Guinea to the southeast, and Guinea-Bissau to the southwest. Senegal also borders The Gambia, a country occupying a narrow sliver of land along the banks of the Gambia River, which separates Senegal's southern region of Casamance from the rest of the country. Senegal also shares a maritime border with Cape Verde. Senegal's economic and political capital is Dakar. Frederick I of Liegnitz, was a Duke of Chojnów and Strzelin from 1453, of Oława and Legnica from 1454, of Brzeg from 1481 and of Lubin from 1482. 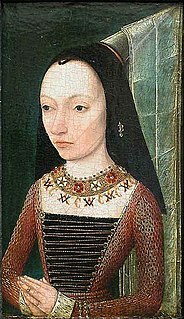 Margaret of York —also by marriage known as Margaret of Burgundy—was Duchess of Burgundy as the third wife of Charles the Bold and acted as a protector of the duchy after his death. She was a daughter of Richard, 3rd Duke of York, and Cecily Neville, and the sister of two kings of England, Edward IV and Richard III. She was born at Fotheringhay Castle, Northamptonshire, in the Kingdom of England, and she died at Mechelen in the Low Countries. Alexander Agricola was a Netherlandish composer of the Renaissance writing in the Franco-Flemish style. A prominent member of the Grande chapelle, the Habsburg musical establishment, he was a renowned composer in the years around 1500, and his music was widely distributed throughout Europe. He composed music in all of the important sacred and secular styles of the time. Year 1506 (MDVI) was a common year starting on Thursday of the Julian calendar. William Grocyn was an English scholar, a friend of Erasmus. April 18 is the 108th day of the year in the Gregorian calendar. There are 257 days remaining until the end of the year. Ippolita Maria Sforza was an Italian noble woman, a member of the Sforza family which ruled the Duchy of Milan from 1450 until 1535. She was the first wife of Alfonso, Duke of Calabria, who later reigned as King Alfonso II of Naples. Year 1484 (MCDLXXXIV) was a leap year starting on Thursday of the Julian calendar. Year 1421 (MCDXXI) was a common year starting on Wednesday of the Julian calendar. Year 1451 (MCDLI) was a common year starting on Friday of the Julian calendar. Year 1543 (MDXLIII) was a common year starting on Monday of the Julian calendar. It is one of the years sometimes referred to as an "Annus mirabilis" because of its significant publications in science, considered the start of the scientific revolution. Year 1431 (MCDXXXI) was a common year starting on Monday of the Julian calendar. The 1440s decade ran from January 1, 1440, to December 31, 1449. Year 1516 (MDXVI) was a leap year starting on Tuesday of the Julian calendar. Year 1508 (MDVIII) was a leap year starting on Saturday of the Julian calendar. Year 1479 (MCDLXXIX) was a common year starting on Friday of the Julian calendar). Year 1430 (MCDXXX) was a common year starting on Sunday of the Julian calendar. Year 1445 (MCDXLV) was a common year starting on Friday of the Julian calendar. Year 1325 (MCCCXXV) was a common year starting on Tuesday of the Julian calendar.